Okay, so this short article could be classed as an act of self-indulgence, but I would prefer that it was seen as a record of one family’s utter misery at losing not one, not two, but three of its sons. This is a short narrative, which probably undermines the huge amount of time taken to gather all the relative material from many varied sources. It proves what can be done with perseverance and a large slice of luck. One very large stumbling block I had was the fact that my father, and all traceable members of his family, had died. I therefore only had what few details my mother could remember, and a delightful antique postcard to go on……. The words “WJ Farrier, on board HMS India, return to clerk’s office” were written over the top of his hand writing in huge letters, which was presumably done by the sensor on board. I found it strange that he was allowed to mention the fact that his ship had “got the Germans”, but this could have been because it was during the early days of the War. However, back to the present day……. I knew that this postcard was sent by my Great Uncle Walter to his family in Hastings, Sussex, but knew nothing of which unit or indeed which service he was serving in. I was always told that he served with the army in Gallipolli, and could never quite understand why he should be writing from on board ship, talking about “getting Germans”. It finally turned out after much delving into records at Kew (an invaluable source; a must for any serious military historian), that he was a member of the Mercantile Marine, the forerunner of today’s Merchant Navy, serving onboard HMS India in the engine room. India was a very fast pre-war P & O cruise liner employed on the ‘Britain to Australasia’ run. During early 1915 she was commandeered by the Royal Navy, converted to military use and captained by a Royal Naval Captain, Commander Kennedy, RN). Able Seaman 801188 Walter James Farrier was lost at sea after the ship was torpedoed two and a half miles off of the Norwegian coast, on August 8th 1915. This in itself was seen as a gross act of misconduct and the Norwegian Government complained bitterly to the German Government about this act of war within her own territorial waters. The records state that out of her total crew of 301 Officers and Men, 160 were lost in those icy waters. Walter’s body appears never to have been recovered as the ship sank within minutes, and being a member of the engine room staff he probably had no chance of getting up from the depths of the great liner in the very short time before she floundered. He is commemorated on the Mercantile Marine’s ’Memorial to Those Lost’ on Plymouth Ho. So ended the life of one of my Great Uncles, Walter James Farrier, born 11 June 1886; died 8th August 1915. He, however, was not the first of the family to die. As stated earlier, I always knew that there was at least one other family member to die in WW1, but it did indeed turn out to be three. Armed with this information I telephoned the Commonwealth War Graves Commission to find out if he had a known grave. I was told that he was indeed buried in Bethune Town and given the plot and grave number. This proved to be most useful, as I had managed to barge my way onto an organised War Graves trip with my son’s school! In the mean time I had been in contact with Alan Readman at the Sussex Records Office to see if I could locate the other two soldiers that my Great Uncle had been killed with. This I managed to do, and found out that they were both buried in the same row as him just a few graves separating them. After the same searching process at Kew, I found out that Thomas Frederic Farrier was born on 29th January 1889 and died, as stated above, on 17th May 1915. I also found out that Tom’s Royal Sussex Regiment were on Guard Duty at the Tower of London, from November 1914 until they embarked for France on 18th February 1915; hence his brother Walter’s comment marked with ‘*’ at the beginning of this article. The last ‘long lost’ brother came to light a few years later. I had found out that Albert Edward Farrier’s name appeared on the Thiepval Memorial to the missing in France, but knew very little else. As a bit of a long shot one day, I telephoned the Hastings Library to see if they had any archive copies of local newspapers from the WW1 period. A very helpful librarian informed that they did, and dutifully took down the name of my last remaining lost Great Uncle. A couple of days later, a large envelope greeted me on my return from work. Inside resided the fruits of the kindly librarian’s efforts. There was an A3-sized copy of a Hastings local paper dated September 1916. From this page grinned the faces of no less than seven men who were connected with my family. A caption below all seven photos stated that my Great Grand Mother, Mrs Sarah Farrier, had sent them in, as was obviously the moral-boosting custom of the day. Not only were there photographs of the above-mentioned Walter, Thomas and Albert Edward, but also what turned out to be two step-brothers (one of who was killed in the battle of Aubers Ridge/Neuve Chapelle, France, on 9th May 1915 whilst serving with the 5th Royal Sussex Regiment), and also a son in law. 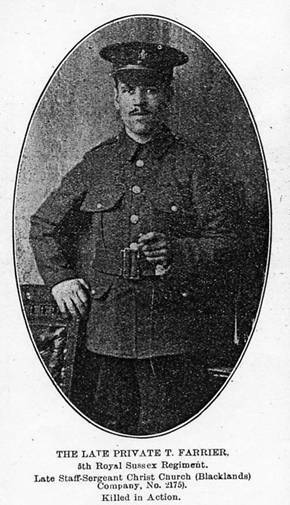 A further brother, Percy Farrier, was reported as having his lower arm blown off, and convalescing in Norwich. He survived the War and I remember him with his ‘tin arm’ until his death in about 1967. My only regret being that I was too young to ask the thousands of questions that I would ask him now! Another visit to Kew later, and I had found out that Private 27715 Albert Edward Farrier, 8th Battalion Royal Fusiliers (born 28th March 1897) had been killed in action at Ovilliers during the Battle of the Somme on 4th August 1916, at the tender age of 19. As a slight aside, a further Newspaper report supplied by my librarian friend, from late November 1914, showed that the Farrier Boys’ father had died during that month; hence the ’**’ note on the postcard narrative at the beginning of this article. I have visited Tom’s grave in Bethune four times now. The long walk through the local French graveyard with its imposing family vaults is an experience in itself, coming upon the neat rows of British military graves at the far end always brings a lump to the throat. It never fails to be an immensely moving experience, placing flowers and a photograph or two on the grave of a man that I never knew, but have an incredible closeness to. Of his brothers; Albert, I can only go to read his name on the massively impressive red-bricked Theipval Memorial to the Missing; its looming form forever a site of wonderment seen from miles around in the rolling Northern French countryside; of Walter, I can go to see his name on the glorious stone and brass memorial at Plymouth Ho. I hope that this has proved a reasonably interesting read, albeit a bit convoluted in parts! I also hope that it gives many of you the encouragement to go out there and track down your forefathers; after all, most of us had people in the family who fought in the Great War. Thomas Frederic Farrier (Left) and an unknown colleague probably pictured during their London stay whilst the Royal Sussex Regiment were on guard duty at the Tower of London; November 1914 until posted to France, 18th February 1915. Note Tom’s ‘bereavement’ black button.